The Crown Chakra is the most elevated chakra. The chakras act as a ladder to healing, love, and spirituality, moving up to more refined spiritual energy of the Crown Chakra. The Positive Archetype is The Guru. Gurus are people who realize who they are. They are a cultivation of grace, bliss, gratitude, and acknowledge divine intervention. 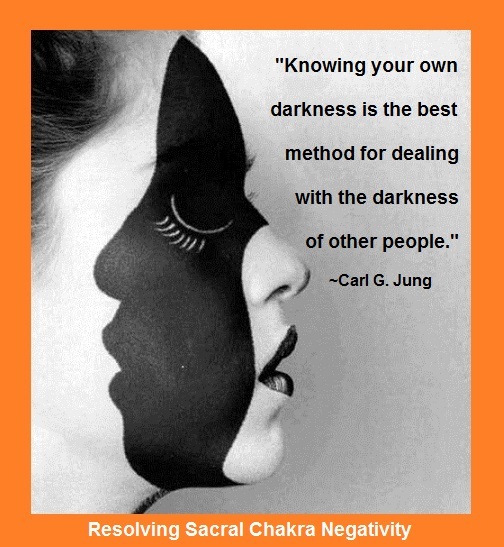 The Negative Archetype is the Egotist. Egotists are people who think their efforts alone carry them through life. They are arrogant, self-absorbed, and inflexible. Function: The Crown Chakra controls the pineal gland, which sits at the top of the midbrain below the cerebral hemisphere. It influences our deep inner cycles, such as sleep, happiness, and tranquility. Its qualities are bliss, beauty, and spirituality. Physical Body Energy: The pineal gland produces melatonin and regulates our body clock. This center eases physical & emotional pain by releasing endorphins. Emotional Body Energy: This energy center wants to cultivate bliss and surrender to ‘WHAT IS’. This state of bliss is often called transcendence. 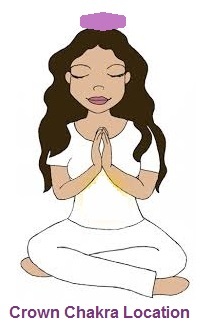 Mental Body Energy: Crown Chakra opens the realm of higher thinking to us. 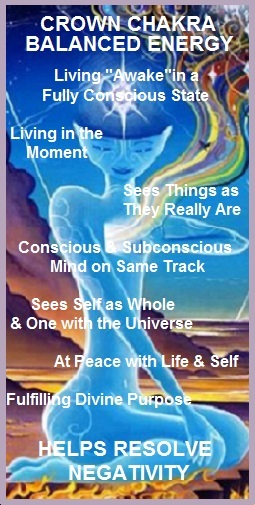 It develops holistic and universal principles of acceptance, respect, and knowing. 1. Open your awareness to a higher power than your limited everyday self. 2. There is a higher self, which can guide your way, and offer you love and protection. Take the time to find this within yourself. 3. Look inside yourself to discover who you are. Release limited ideas of self so they fall away easily. 4. Try not to identify with what has name and form. This is limited and is not who you are. 5. Read spiritually uplifting books. 6. Avoid becoming entangled in situations or with people who reject peace. 7. Explore your true beliefs about life. Don’t accept what has been handed to you without knowing whether it is right. 8. Direct your awareness inward for a moment every day to connect with the part of you that is eternal and indelible. It will guide you through your life if you allow it to. Please check all our categories for more Chakra Healing! 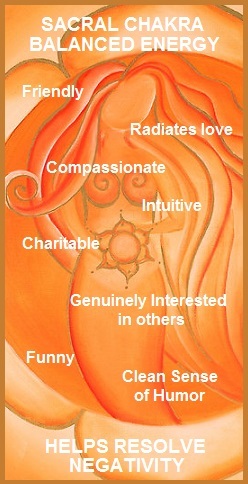 The Sacral Chakra has to do with life, vitality, self-gratification, and passion. Sacral’s Positive Archetype is The Emperor/Empress: A person who enjoys pleasure, abundance, and enjoyment. Negative Archetype is The Martyr: Martyrs deprive themselves of the simple physical pleasures of life. They are critical, sour, and condemning. 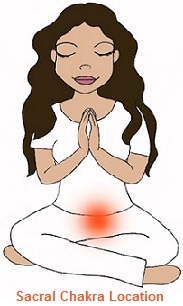 Function: The Sacral Chakra’s function is contingent upon the degree we care for and value our own being. If we feel deserving of good things around us, this chakra opens to receive pleasure and abundance. If we doubt our right to receive pleasure, this chakra becomes depleted. It also controls the appetite, and its lesson revolves around knowing what is enough. Physical Body Energy: The reproductive organs, which control sexual development. Emotional Body Energy: Pleasure, feeling good, deservedness, joy, or feeling bad, envious, and not caring for your body. Mental Body Energy: Attitudes of having enough, knowing that you deserve the life you want, enjoyment/well-being, delighting in good health, and distain for suffering. 1. Honor the physical body by giving it enough food, water, rest, and exercise. 2. Respect the limits of the physical body. Do not become trapped in obsessive acts of exertion and pushing the body beyond its natural limits. 3. Accept your need for pleasure. Create enough good experiences to replenish the spirit as well as the body. 4. Acknowledge the powerful force of human sexuality. Know what one’s values are regarding it. 5. Respect the physical world by keeping order, cleanliness, and beauty around your home, office, and places of recreation. 6. Reflect upon physical energy you put into earning money and the ways that you make financial decisions. 7. Know that you have appetites and needs. Give them a place in your experience. 8. Treat yourself to the joys of life. Know that you deserve what you say you want. Chakras have a positive and negative archetype. 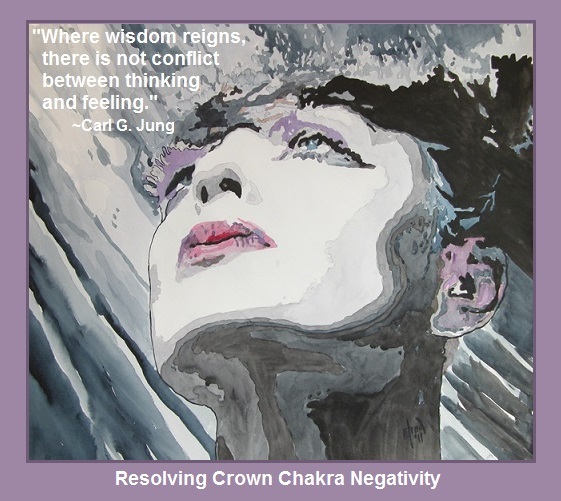 This week we will look at suggestions for resolving negativity of each of our seven major chakras. 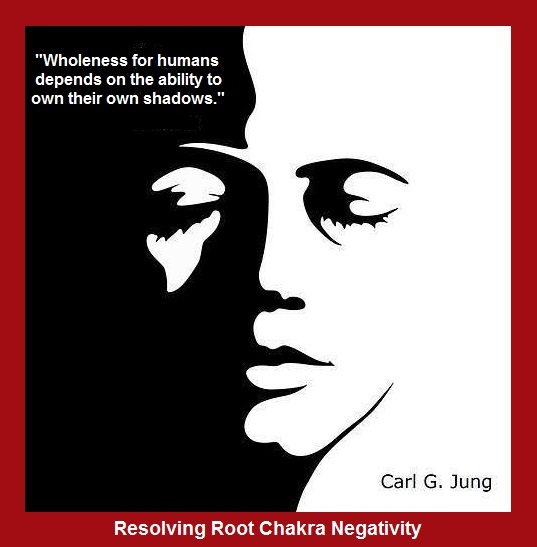 Today we start with the Root Chakra—Positive Archetype is The Mother: Nurturing, self-sufficient, responsible. 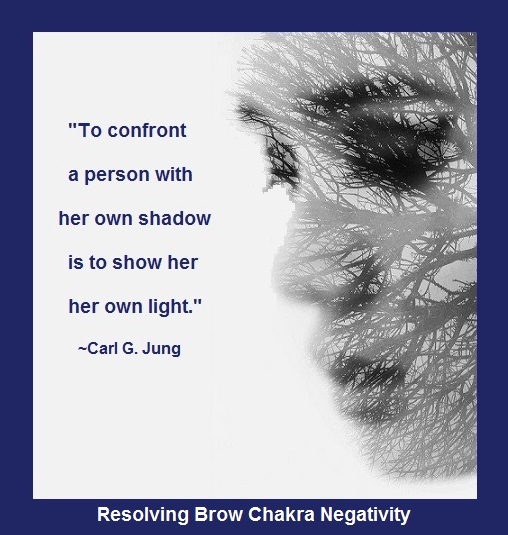 Negative Archetype is The Victim: Lacking energy, empowerment, and life force. Location: In perineum at the base of the spine, and draws energy from the magnetic field at the earth’s core. The energy moves up through the feet and legs, energizing blood and tissues in the body. Function: Stimulates aggressive drives linked to survival. 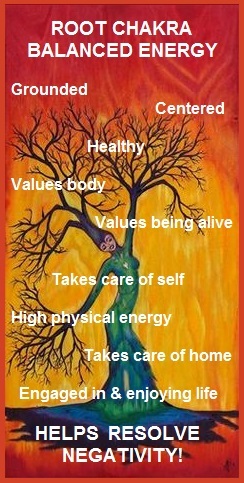 The Root Chakra holds our genetic inheritance. 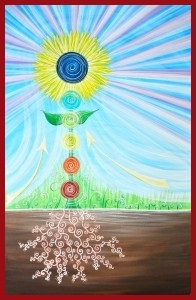 In its unconscious state, the Root Chakra carries the attitudes and prejudices formed by family, church, and culture. Physical Body Energy: Adrenals activate the kidneys’ fight-or-flight function. Emotional Body Energy: Aggression, anger, violence, and jealousy. Mental Body Energy: Attitudes of Separation, exclusivity, territory, belonging, and right to one’s own space. 1. Cultivate patience. When things do not go as planned, you will not lose energy by being angry or frustrated. 2. Allow time for things to come around in a positive way. If you do not succeed in the beginning of a project, rethink it and let things develop. This would be an excellent time to use a Positive Affirmation to Persevere! 3. Do what is necessary to remain stable through change. 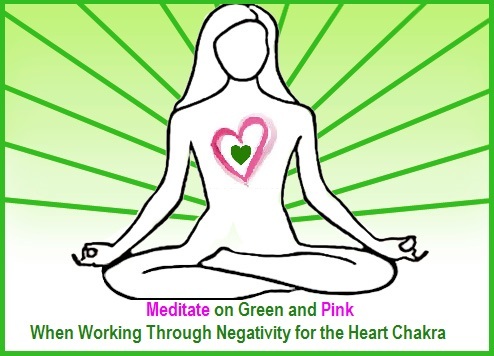 Develop Meditation Skills and ways to slow down the mind. Learn to live with change. Be flexible and adaptable. 4. Be secure in yourself and know that everything will be all right eventually. Trust in life to see you through the difficult moments. Do not despair when things do not go well. Breathe, give yourself time to reflect on what is essential and important. Make a plan to see your dreams unfold. Life without a dream is dull. 5. Be Grateful for the life you have and work to bring as much order into your life as possible. When things do go astray, you have more reserves to fall back on. 6. Enjoy your Root Chakra’s Balanced Energy being grounded, centered, healthy, and loving yourself! Finding the love for oneself, in spite of whatever may have happened in the past, brings healing and releases the past. Being able to forgive the past, including those who were hurtful, abusive, or destructive, helps keep the heart open. Accept the present as the point of power where love can heal our wounds and restore our sense of wholeness. Learning to accept ourselves as we are, without pride or pretense, keeps the heart open and allows the good to come to us. Most importantly, make a list of what makes your heart sing. Commit yourself to the process of reanimating joy by doing what you love, with people you love. Movements for opening the Root Chakra involves the feet, legs, and hips. 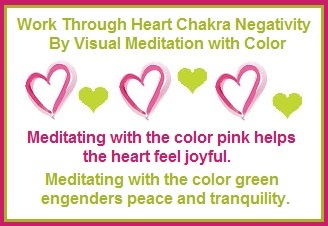 I have combined two simple exercises from the book Healing with The Energy of the Chakras by Ambika Wauters. It is more fun and enjoyable doing the Root Chakra movements to music. It helps take away any sense of exercising. 1. Spread your feet about a foot apart. 2. Take a deep breath through the nose, rise up on your toes, bend the knees, then come down on heels. At the same time release your breath and let out a sound. I like to visualize my heels as roots going into the ground. 3. Repeat several times. Emphasis on the downward movements of the heels. 4. Next walk on your toes with your arms raised in the air. Shake your hips from side to side. Feel free to sway your arms with the music. 5. 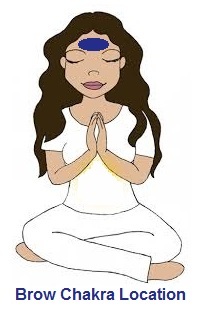 This exercise is grounding and allows energy to flow through you freely. ”Your soul is on the bottoms of your feet”, a quote by Gabrielle Roth, a modern American Shaman, dancer, and teacher.